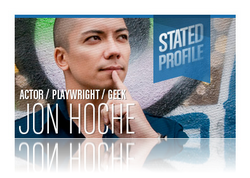 Stated Magazine did a profile/interview with me about being a Geek Actor/Playwright. It's a great magazine and I'm honored to be sharing space with amazing people like Felicia Day, Grace Helbig, Brea Grant, Bela Fleck, Molly Crabapple & Qui Nguyen. You can see the full interview HERE.